Hundreds of business are using GT Notify SMS Notification to help them on their marketing or notifications around the world. Do you wants to use the GT Notify SMS system in your business but having concern of the investment of the equipment? Now with our affordable rental package, you will be able to use the system with as little as $128 (SGD) a month (Singapore Only). Plus the unlimited SMS packages from local telecom provider, you will save a huge amount of operating or marketing expense. What is GT Notify and Why GT Notify? 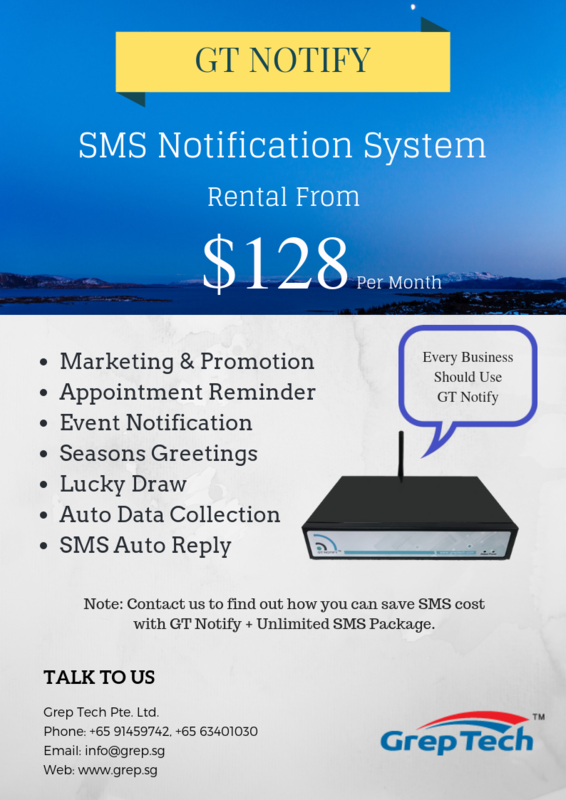 The GT Notify SMS system is the ultimate solution for any company to start their SMS campaign, either for SMS marketing, event notification, scheduled reminders, holiday greetings, SMS auto-responder, SMS auto follow-up, SMS lucky draw… and many more! Why GT Notify? What is the difference between GT-1688 and GT-2688? 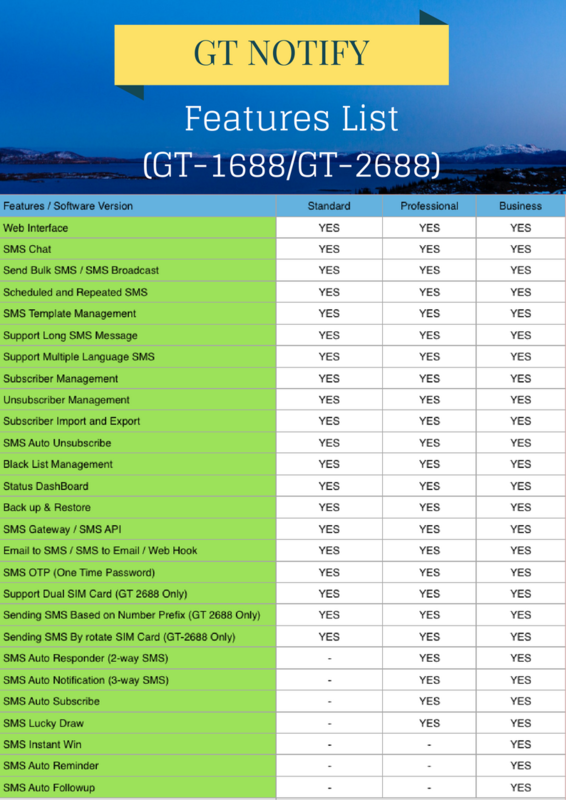 GT-1688 is the single SIM card system, suitable for most small business. The SMS sending speed is about 1200 SMS per hour. GT-2688 comes with 2 SIM card slot, and can have 2 SIM cards insert in the system. GT-2688 can rotate between 2 SIM cards when sending SMS, and the speed will be around 2400 SMS per hour. What is the best telecom package for your SMS system? At the moment (Year 2018), the best choice is the SIM Only plan from Singtel. Singtel SIM Only plan has the option of the unlimited SMS option, cost $36.05 per month, more detail can be found from the following link. What is the minimal contract period? The minimal contract period is 1 Year. Is there any other charges or fees? 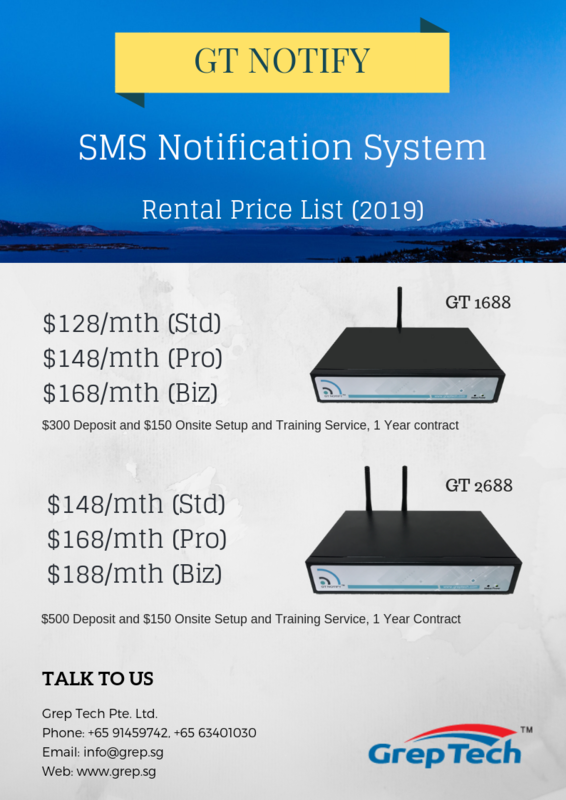 Apart from the monthly rental charges and telecom charges, there will be $300 deposit for GT-1688, or $500 deposit for GT-2688. Deposit will be refund when the equipment been returned. And one time $150 onsite setup and training fee. First time payment (include deposit, setup and training fee, and first month rental) will be made through cheque or cash. Future monthly payment will be charged through Interbank GIRO. I am still not sure, can I see a demo? Sure, just contact us to arrange a demo at our office or at your office.